Often a change of scenery helps refresh the mind and opens it to new experiences. As convenient as a city is with all its centrally-located amenities, sometimes it’s just nice to get away from it all. A visit to the Wicklow countryside is also a nice reward for well deserving team members. That is why many companies and organisations hold meetings, workshops or retreats here at Kippure Estate. Kippure is a little piece of heaven, surrounded by the majestic Wicklow Mountains, bordered by the River Liffey and filled with rich woodland, and rolling heather-clad hills. And the best part is we’re only 30 minutes away from Dublin city centre! At Kippure Estate we have various-sized meeting and reception rooms and we can organise the facilities specifically to your requirements. In addition, we can provide audio-visual equipment, breakout rooms and other essentials to ensure your meeting and training event run as smoothly and enjoyable as possible. 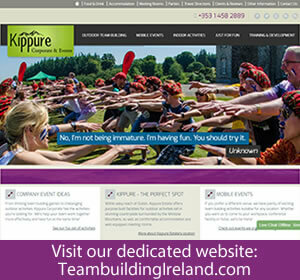 Kippure Estate is known for providing quality across the board for a host of corporate events. Our dedicated events manager will plan and organise your visit particularly for you. Throughout the day our team of chefs works tirelessly preparing anything from organic vegetarian food to a rustic outdoor barbeque hog roast. After the day’s meeting, or a day of team building activities, why not avail of our residence bar? You could even have an overnight’s stay in one of our lodges. Kippure Estate can accommodate up to 120 people. Kippure Estate is more than just a meeting venue – it’s a location in serenity for you to experience. Our qualified team building staff can entertain you throughout the day by leading your group in a series of energising icebreakers, performing activities and providing beneficial feedback to your group and individually. Your organisation or company can also take part in a large variety of outdoor activities whilst you are here, including treasure hunts, high and low ropes courses, climbing and abseiling, nature walks, orienteering, survival skill challenges and many more adventurous and fun activities! If you are seeking a unique location to host your conference or corporate event, then Kippure Estate is the definitive choice for you.